Collegiate Farm Bureau at UW-Madison will celebrate its annual Ag Day on Campus with the theme ‘The One Percent Who Feed the 100 Percent.’ The event will take place Wednesday, April 17, from 9 a.m. to 12 p.m. on Library Mall in downtown Madison to educate students on the importance of agriculture. Thanks to technology and dedication, farmers, who make up one percent, are producing food for 100 percent of the population. As students walk through Library Mall, they will be able to taste Wisconsin food products provided by The University Club and participate in interactive activities such as a photo booth, agricultural trivia and Culvers’ giveaways. Additionally, 2,000 pints of milk, 2,000 cups of Yodelay yogurt, cheese and hot food will be distributed, and students will be able to use our themed Snapchat filter across campus. Collegiate Farm Bureau members are excited to use this event to “agvocate” for the agriculture industry. Members are looking forward to sharing their agriculture stories and how they have grown through the industry and encourage a greater appreciation for Wisconsin farmers. 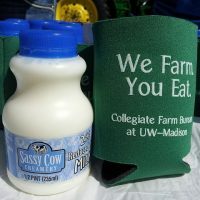 Sponsors for the 2019 Ag Day on Campus include the following; Gold: Badger Dairy Club, Culver’s Franchising System, LLC, Dane County Dairy Promotion, Rosy-Lane Holsteins and Yodelay Yogurt. Silver: Alpha Gamma Rho, Dairy Business Association, Milk Source, UdderTech and Wisconsin Corn Growers Association. Bronze: Association of Women in Agriculture, Brooks Farms, Crave Brothers Farmstead Cheese, Dairy Farmers of Wisconsin, Ebert Enterprises, Landmark Services Cooperative, Larson Acres, Professional Dairy Producers, Wisconsin Beef Council, Wisconsin Cranberry Association and Wisconsin Pork Association. For more information visit https://cfb-uw.com/ and follow at http://www.facebook.com/UWAgDay/ and Twitter and Instagram @uwmadisoncfb.